Melt butter in a small pot. Add flour and stir until all the butter is absorbed and the flour is moist. Add 1/2 cup of milk, turn burner to medium high and whisk until there are no lumps in the sauce. Add the rest of the milk and the cheese. Bring to a high simmer stirring until the sauce thickens, about 5 minutes. Season with salt and pepper and turmeric if desired. Pour over your favorite pasta. Add cut-up hot dogs and peas (or broccoli) for a complete kid meal. I found this recipe in a grocery store pamphlet and it sounded good. It's been sitting on my desk for weeks waiting to be tried. I almost threw it out a few times, but then I'd stop because I really did want to try it. It was good, but it seemed to be missing something. I think if it had a crust and was more of a quiche instead of a casserole it would have tasted better, but then again it would have had more calories. Oh, and I used Egg Beaters instead of real eggs, so that probably had alot to do with it. It would be a good dish to serve a crowd for a brunch though. In a large bowl, whip eggs, egg whites, flour, sour cream and cheeses. Add spinach and sauted vegetables. Pour into a 9x13 inch baking pan that has been sprayed with cooking spray. Bake for 40 minutes. Serves 4 large portions at Weight Watchers 6 pts each, or 8 portions for 3 points each. This dinner is as easy as you can possibly get. It's a prep in 10 minutes or less cooks in 15 minutes dinner. And yet, it's healthy and filling. There's only 4 ingredients plus cooking spray. Coat chicken breasts with your favorite bar-b-q sauce. Spray cookie sheet with cooking spray. 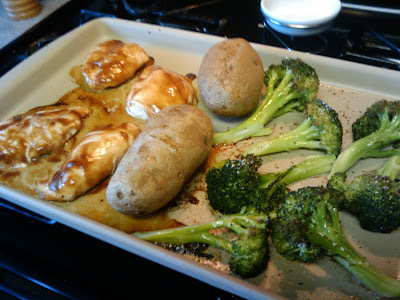 Place chicken on one end of a cookie sheet (I used stone wear from Pampered Chef, but whatever you have will be fine.) Prick potatoes with a fork and microwave for about 4 minutes to par-cook them. Place them on the cookie sheet. Spread fresh broccoli on the other end of the cookie sheet in one layer. Sprinkle with salt and pepper or if you have it, a garlic & herb type seasoning. Pre-heat oven to 425 degrees. Do not put food in until your oven is fully pre-heated. Then bake for 15 minutes. If your chicken breasts are cut thin enough, this should be plenty of time. 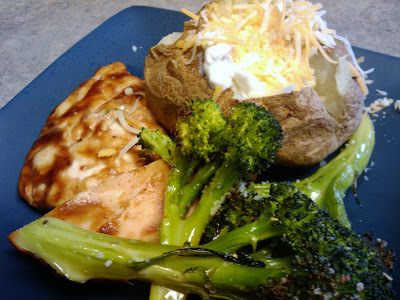 The potatoes finish baking, the broccoli gets crisp and delicious and the chicken is super juicy and tender. Enjoy! Sometimes dinner comes together by an inspiration from what is in the refridgerator. Tonight's dinner was one of those. I had a couple of ingredients I wanted to use up before they turned and I think I came up with a pretty tasty dinner. I used Salmon, but I was originally going to do this with a chicken breast, I'm sure it would taste good too. Oh and my daughter Izzie ate her entire salmon fillet! To make sauce: In a small pot, pour the half and half. Add the crushed garlic clove and the zest of the orange. Then squeeze in the orange juice. Season with salt and pepper and place the whole rosemary sprigs in the pot. Simmer on medium-low for about 20 minutes stirring frequently until the half and half reduces down and thickens up. While sauce is reducing: Season salmon fillets and grill, I used an indoor grill pan and cooked the fillets about 4 minutes per side, but it depends on the thickness of your fillet. They are done when they flake apart easily with a fork. Pull rosemary& garlic clove out of the sauce and strain if desired. Drizzle over fish and serve. Serves 2. Sides: Grilled asparagus with sauce drizzled over them & roasted potatoes. Last time I went to the grocery store, I bought a Tandoori Seasoning packet for chicken. Sometimes I like pre-packaged seasoning packets (as long as they are all spices and not just preservatives and salt.) It is an excellent way to try a new flavor profile without investing in a bunch of spices that you don't use on a regular basis. For the Tandoori Chicken, I mixed the spice packet with yogurt, lemon juice and minced onion. I marinated the chicken for an hour or so and then broiled in the oven. I think real tandoori chicken is cooked in a special clay pot, but this was yummy. Looking for a side dish and not wanting to rely on the standby rice, I came across this dish on allrecipes.com and realized I had all of the ingredients (sort of)! This vegetable side dish is very delicious and will definately be repeated in the future! 4 large potatoes, finely chopped <- I didn't have any potatoes in my house so I used sliced canned potatoes, these are good to keep on hand for when you are in a pinch! 1 cup cauliflower florets <- I had to use frozen, can't wait to try this out with fresh! 1/2 cup fresh green peas <- Again with the frozen, but probably will keep this ingredient frozen. 1 large onion, chopped <- I used half a large onion, which was plenty for me! 1 teaspoon black mustard seed <- I didn't have black, but I did have yellow, so I used that. 4 green chile peppers, chopped <- Growing in the garden, so I used super fresh! 2 teaspoons minced fresh ginger root <- I keep ginger root in the freezer and use a grater to grate off some whenever I need it. Place the potatoes, cauliflower florets, carrot, and peas into a microwave-safe bowl, cover with plastic wrap, and microwave on High until the vegetables are very hot and starting to soften, about 2 minutes. Remove the plastic wrap, and drain the vegetables in a colander. Place the vegetable oil in a large skillet, and heat over medium heat. Cook and stir the onion until it turns golden, about 10 minutes, and stir in the cumin seed, black mustard seed, and bay leaves. Cook and stir until the seeds begin to sputter, about 30 seconds, and then add the green chiles, garlic, and ginger. Cook and stir until the garlic begins to brown, about 1 minute. Stir in the ground cumin, curry powder, and chili powder, and then add the partially cooked potatoes, cauliflower, carrot, and peas. Cook and stir until the vegetables are tender and coated with spices, about 30 minutes. Sprinkle with cilantro leaves. 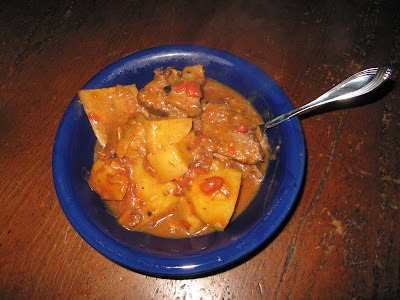 Weight Watchers: I figured it to be about 3 pts per serving, using the canned potatoes. I was browsing through all my favorite recipe websites last week looking for inspiration for creating our weekly menu in preparation for grocery shopping. Cool weather is here, so I'm totally into soup mode. But I wanted something different than my fall back standards. Something hearty to make me feel better about not being able to eat all the wonderfully tempting cream soups I keep reading about. This beef stew really caught my eye. It sounded totally different from my normal taste profile. I made it yesterday and it lived up to the hype. It was delicious. I found the recipe on the cooking blog Simply Recipes, one of my absolute favorites. Elise Bauer, the blog's owner, features good home cooking with just enough of a challenge to make it interesting. She describes her recipes as using "mostly whole food ingredients and only occasionally a few things from cans or prepared foods. We believe in a varied, healthy diet, using real butter, real cream, eggs, lots of green vegetables, and protein from meat, fish, beans, and cheese." Exactly the way I like to cook. I've reprinted the recipe here in its original form. What did I do differently? Well, I only had one type of Paprika so I went with that. I used fire roasted tomatoes. (yum!) I used a pale ale, because I opened the wrong bottle by mistake and didn't want to waste it. I totally forgot the carrots, and not on purpose because I love them. I cut the recipe in half but I used the whole 12 ounces of ale. Even then, by the time I added the veggies, it needed a bit more liquid. I added a can of beef broth. It was still a very thick stew. This is not a fast meal. It took at least 3 hours, not counting prep time. But most of that is time in the oven or simmering on the stove. Prep itself was fast and easy. It is a wonderful stew to have cooking in the background while doing housework on a cold winter day. So aromatic!! I think the recipe turned out great. It will definitely go in my winter rotation and next time I'll even buy some smoked Paprika! 1 Preheat oven to 300°. Combine flour, hot paprika, smoked paprika, 1 teaspoon of salt, and 1 teaspoon of black pepper in a large bowl. Dredge the short ribs in the flour mixture. 2 In a large Dutch oven over medium-high heat, cook bacon until fat renders. Transfer bacon with a slotted spoon to paper towels and reserve. Pour off all but 1 Tbsp of the bacon fat from pot. (Do not pour down the drain or you will clog your drain when the fat hardens as it cools.) Add short ribs and brown on all sides, 3 to 5 minutes per side. 3 Chop reserved bacon and set aside. Transfer short ribs to a plate and reserve. Add the onion and 1/2 teaspoon of salt to the pot and cook, stirring, until softened, about 3 minutes. Add garlic and cook, stirring, until fragrant, about 1 minute. Add the ale and, using a wooden spoon or spatula, scrape up any browned bits on the bottom of the pan. Add tomatoes and their juices and reserved bacon. Increase heat to high and bring mixture to a boil. Return short ribs to pot, cover, put in the preheated oven, and cook two hours. 4 Peel potatoes, turnips, and carrots, and cut into 1-in. pieces. Add to short ribs, cover, and cook until potatoes are tender and meat pulls away easily from the bone, about 30 minutes. Add salt and pepper to taste. 5 Spoon off excess fat (it helps if you have a fat separator). Remove the bones if you want, before serving. Hey everyone, sorry there hasn't been a new recipe up in a couple of weeks. I've been traveling. Hopefully I'll be able to post something new this weekend! I hope everyone is having as terrific a fall as I am having. Check out my main blog, to see what we've been up to! I have been craving my mother’s pizza lately. There are pizza places here but they are not hitting the spot. Of course, as they are not my mother, I guess that is acceptable. I called my mother and got her recipe for dough. I used tomato sauce I had made for eggplant parmigiana a couple of weeks ago and froze. I swear, it is the dough that makes the difference. 1 Cup med-hot water (105-115 degrees F...hot to the touch, but not scalding). 1 tsp of sugar and 1/2 salt. Dissolve 1 Tablespoon yeast in 1Cup med-hot water (105-115 degrees F...hot to the touch, but not scalding). Add 1 tsp of sugar and 1/2 salt. Let is rest for about 20 minutes while it "proofs." After it has "proofed" or the yeast has activated add 2C flour with a spoon. Then, by kneading, add 1Cup of flour. Punch down and roll out with a rolling pin or with your hands press into the pan. Let rise again then add the "fixins." I want to take a moment to welcome another Contributing Cook to The Frickin Chicken! I'm taking this site global. You've already met Jules, the American living in Turkey. Now allow me to introduce you to Kate from England. Kate has lived in several places, including America. She likes to eat healthy, homemade and a lot of times vegetarian meals. Enjoy! METHOD: Wash, dry, prick and bake in pre-heated oven on very hot - circa 220 Celsius or 400 Fahrenheit. Cook until crispy on the outside, soft in the middle. Circa 40-60 minutes, depending on potato size. INGREDIENTS: seasonal root or firm vegetables, red or yellow pepper, sweetcorn, tomatoes, jalapenos, vegetable stock powder, flour (gram, wheat, corn - whatever available), tvp, Quorn (not vegan) or canned beans, chili flakes or powder, paprika, grated cheese (optional), milk or soy milk (optional). 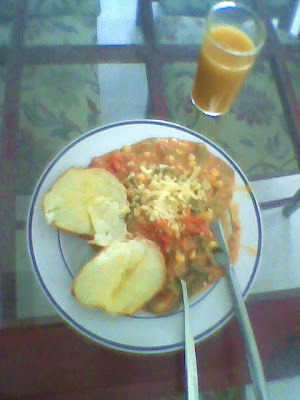 - add boiling water from a kettle or microwave (or add cold and bring to the boil in the pan) and stir to a thick sauce. Bring to a rolling boil and simmer on very, very, low heat (plate warming hob option) until the potato is ready. Serve the potato split with butter (vegetarian) or margarine (vegan). Nice with a glass of mango and apple juice, cider-shandy (or a light beer and slice of lime for the decadent!!!). From Wikipedia, A po' boy (also po-boy, po boy, or poor boy) is a traditional submarine sandwich from Louisiana. It almost always consists of meat or seafood, usually fried, served on baguette-like Louisiana French bread. I love po'boys. This isn't truly authentic because usually the seafood is fried, but here I am on Weight Watchers, so I "grilled" my shrimp in a lime-cajun seasoning in a cast iron skillet. It was still finger lickin' good! To make the coleslaw, julienne (cut into very thin strips) the cabbage, place in a bowl. Grate half of a carrot and add to the cabbage. Add mayo, apple cider vinegar and salt and pepper. Stir to mix evenly and let set in the refrigerator for a few hours. It can be eaten immediately but if you let it sit, the cabbage breaks down more. To make the shrimp po'boys marinade shrimp in the lime juice, cajun seasoning, salt and pepper. Let sit for a few minutes. Cut baguettes lengthwise in half, leaving a hinge. Toast in toaster oven or under a broiler. Preheat a cast iron skillet (if you don't have cast iron, you need at least one of these in your house, otherwise you your favorite skillet.) Place the shrimp around the skillet and cook for about 2-3 minutes per side. Assemble sandwich by placing coleslaw and then the shrimp. To make oven fries, peel and cut a large potato into french fry strips. Spray with cooking oil and season with salt, pepper and cajun seasoning. Place in one layer on a cookie sheet. A pizza stone or other stoneware works amazing for this too. If you have a convection oven (my toaster oven has this setting) this seems to get the fries crispier. Otherwise pre-heat oven to 425-450 degrees and cook for about 20 minutes flipping in the middle. This meal serves 2 but can easily be doubled. Weight Watchers: 9 points for entire meal. Hamburger Helper is probably a copyrighted term, but I don't know how else to describe ground beef/gravy dishes. They are so simple to make from scratch and making it homemade there is no preservatives. I would never consider this a company dish, but for a family dish it is filling and cheap. This version is extremely weight watchers friendly because it only has 1/2 lb of beef for four servings (you can add more beef if you aren't on a diet.) It's also very healthy with the vegetables, and fiber that it has in it! Oh, and for those that are curious, I'm still in denial that I'm doing weight watchers and I still don't want to talk about it. By the way, this is a huge portion for 4pts, you are filling up on fiber and vegetables but it feels like you are eating a big beefy dish. Substituting rice will increase points. In a small pot put the 1 cup of barley with one cup of water and one cup of beef broth. Bring to a boil, cover and reduce to a simmer. Simmer for 45 minutes. In a large skillet, saute the onion and garlic. Add ground beef. Break up into small pieces. Since there isn't much meat in the dish, having it in small bits ensures you get a little bit of meat in each bite. Add rosemary, oregano, salt and pepper. Add diced mushrooms and cubed zucchini. Continue cooking on med-hi to hi until mushrooms start to brown. Add Worcestershire sauce. Sprinkle the cornstarch over the meat and mushroom mixture. Stir until the cornstarch dissolves into the dish. Add about 2 cups of beef broth and bring to a boil. If it thickens too much, add more water (or broth) if it is too loose, keep boiling until it reduces and thickens a bit. Add barley when it is finished. Serves 4. Wheat roll on the side was an additional 1 point. This dish can be considered a drink, a dessert or a side. Hoşaf (horshaf) is actually a compote or stewed fruit dish. It can be made with a variety of fruits such as dried raisins, apricots, plums, pears etc. It is fairly low in calories, which makes it a nice treat when you are craving something sweet. My fiance's father used to drink it in his youth, before Coca-Cola was in vogue. This drink is incredibly refreshing, especially when it is hot out. This is also traditionally served as a side with Börek. Seriously--Make this! It is one of my favorite dishes. I actually have some in the fridge as we speak. I like it for late night snacking, it doesn't make me feel guilty, but satisfies that craving for sugar. Boil 8-10 cups (or so) of water to a roiling boil. When it is boiling dump your dried fruit in the water and shut off the heat. Let the fruit sit out in the water until the water cools. Once the water has cooled put the pan in the fridge. Wait at least a day before eating the hoşaf, don't worry about using it all up. The longer the hoşaf sits the tastier it becomes. You could ad sugar (this should be done when the water is hot) but I think it is unnecessary.